What Are the Best Blue Light Blocking Glasses to Buy? I went out looking for what are some the highest rated & most recommended blue light glasses products & brands that are available to buy, which can help you reduce your exposure to harmful artificial blue light waves from disturbing your sleep patterns and harming your eye health. The Swannies glasses are from Swannick Sleep. James Swannick is one of the founders behind this range of eyewear. James has been interviewed by Dave on Bulletproof radio before about hacking self-esteem and health. However, he also has a passion for using a simple biohacking gadget, glasses, to help improve health. These particular frames were massively popular at the 2016 Bulletproof conference expo hall. I can’t tell you how many Bulletproof biohackers I saw wearing these. The reason they wore them at the conference was due to the artificial light in the expo hall. What a great biohacking tip to enjoy walking around an artificially lit exhibition hall wearing these to help act as anti-blue light glasses, plus, look stylish. 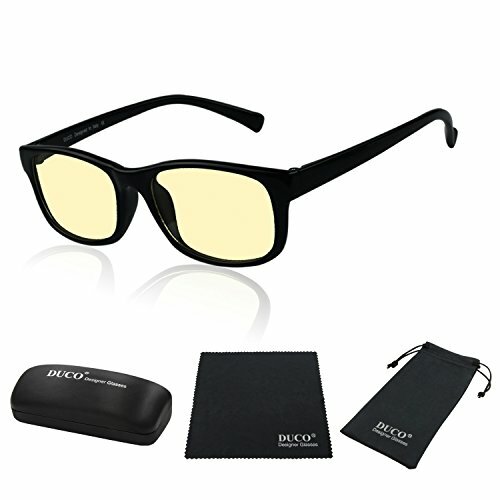 The Duco Anti-Blue Light Glasses are very comfortable to wear all day. These were my first pair of glasses. I personally bought the lighter lens colour option to start, which is a lighter yellow hue. The reason I went with the yellow lens vs amber lens was so I could wear them around the office. I didn’t want to stand out too much by walking with dark lenses indoors, and also dealing with the public at work. These particular lenses are fantastic if you work on a computer during the day. The were designed as blue light protection glasses to help minimise eye strain when looking at a screen for hours. I feel they do that job very well! What I like about these is that they are so light you hardly feel them on your face. The bendable arms on make them very comfortable to wear as they adjust to my head width. If you have a wide head (face) and find some frames are too narrow get these as they will bend to your head shape & still feel good. 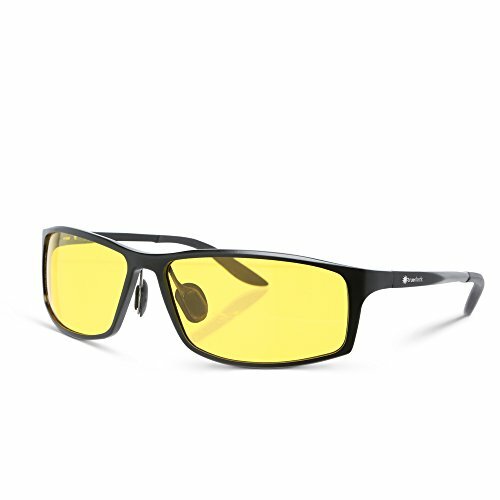 I would strongly recommend getting a pair of these yellow tinted glasses along with a pair of darker red/amber tinted lenses frames. This allows you to be able to switch between the ones that you wear during the daytime for protection from eye strain & ones you wear at nighttime for protecting your circadian rhythm (sleep-wake cycle). The nice thing is Duco also make a darker tint version too for maximum protection of the blue spectrum. The Duco Pro Amber glasses are a good alternative to the Swannies. At night we need to use a stronger shade of tint in the lens to be able to filter out blue light even more compared to the day. This is to help protect our natural production of melatonin that should be being released at night to help us fall asleep. If you can go with both coloured lens options; get the two different pairs if you can. You won’t regret it; will love having the option available for day and night use, trust me! 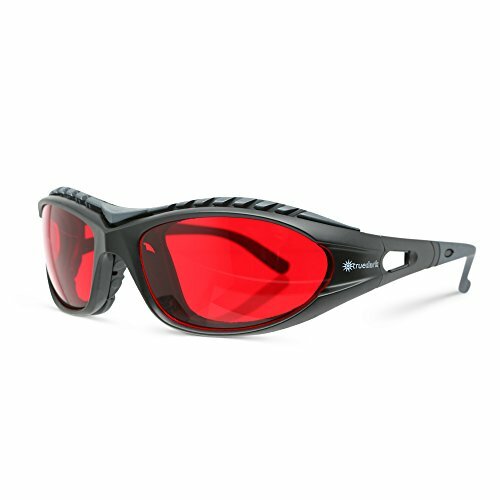 The Uvex S1933X Skyper Safety Eyewear is long-term favourite for many biohackers. They are one of the original brands that were available to buy on Amazon when people were looking to protect themselves from the harmful effects of blue light on our melatonin production and retina health. These are great option if you wear prescription lenses or need to use readers. The problem with the other frames I’ve suggested above is they aren’t designed to go over existing eyewear. This is where I suggest getting the Uvex option to solve this problem. However, if you feel they aren’t stylish enough and you want something more fashionable then also take a look at the Swannies fitovers option available on Amazon. 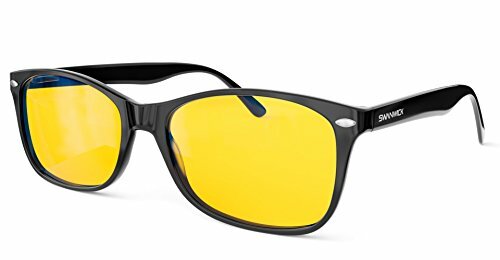 What makes these special is that they are designed to block light coming in from the sides too, so wrapping your eyes for maximum protection from lightwaves leaking from any direction. The problem with the other frames I’ve suggested above is that they do not cover the side of the eyes, only the front. The Uvex Skyper benefits are they block light in your peripheral vision field too. This means, if you are sensitive to any artificial light & want near 100% blocked then these are a good option for you. The SCT orange lens tint is made to help Computer Vision Syndrome. This for people who are damaging their eyes from computer screen glare. The claim to help improve focus, reduces eye fatigue and help inhibit vision problems, like cataracts and age-related macular degeneration. They aren’t the most stylish as they were originally designed as safety glasses for dental hygienists and lab technicians. So they aren’t made to look cool at a regular smartly dressed admin office job, unless you work in a science lab of course. Covers the complete eyeball from top, bottom and sides. Not a good designer glasses look. Try the Swanwick Sleep Fitover frames instead for that. The Elements Active Fitover Glasses are made by the brand HSElements from Vancouver, Canada. They are a great solution for people who work in office settings and need to wear Rx prescription lenses, but want to help reduce eye strain and still look stylish. These are more way more fashionable looking vs the Uvex glasses. 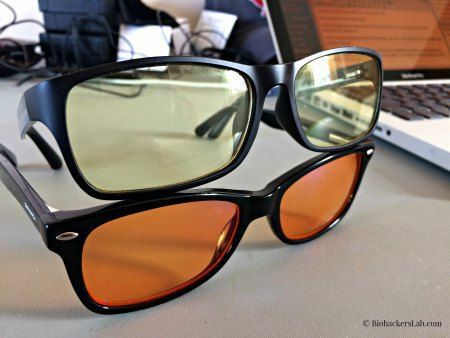 These are recommended solution if you wear prescription lenses or need to use readers when working at the office laptop or computer. The TrueDark Daywalker glasses are endorsed by Bulletproof biohacker Dave Asprey and are his Bulletproof blue light blocking glasses of choice. Truedark glasses are made by the Biohacked brand. These are great option if you want to wear the same pair of glasses that Dave Asprey does during the day. They come in two styles of frames, classic & elite. I personally like the look of the rectangle shaped frame Daywalker Elite over the Daywalker Classic oval shaped classic lenses. Want both day and night-time glasses? Click here to get the Trudark Elite box set which contains both one pair of the Daywalker Elite and Twilight Elite glasses. 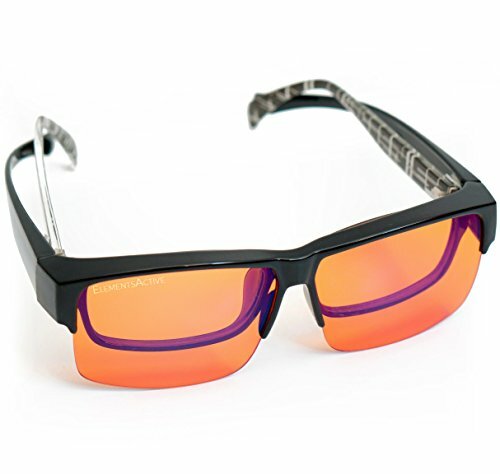 The TruDark Twilight Classic Glasses is one of the original options made by the Biohacked company. These are great option if you want to wear the same pair of glasses that Dave Asprey does during the night. These dark red lens are designed to help promote sleep by preventing melanopsin activation which causes melatonin suppression, and physiological stress They also come in two styles of frames, classic & elite. If you are going out in public then the rectangle shaped frame Twilight Elite frames are much better looking over the Twilight Classic oval shaped classic lenses. Want both day and night-time glasses? Click here to get the Trudark Classic box set which contains both one pair of the Daywalker Classic and Twilight Classic glasses. Did you know that blue light harms your natural sleep cycle? That’s only just one of the health issues from blue light! Artificial blue light that is emitted from LED & LCD light bulbs is a big problem for the health of everyone. From young to old. No matter our age; we don’t want to disturb our natural sleep-wake cycle from exposure to this type of poor light at night. Famous Hollywood stars like Arnold Schwarzenegger, Alfie Allen, Terrell Owens & others have been seen using their own pair of anti-blue light glasses. Plus thousands of others all agree that exposing your eyes to unnatural light, especially at night, is a real health concern for millions of people & can be contributing to their ill health and chronic illness. Use my recommended eyewear to help filter the blue light spectrum so that you can still use your tech, like your cellphone or iPad. Yes, according to a study in the Journal of Adolescent Health that blue blocking lenses significantly reduced the negative effect of LED light induced melatonin suppression in the evening compared to clear lenses. If our eyes are exposed to the blue light spectrum when its dark at night will can cause a disruption to our pineal glands ability to make melatonin. Melatonin is a primary hormone that regulates our body clock for when to sleep and when to wake up. The screens on our laptops, computers, cellphones, iPads, and TV’s all emit screen glare problems. This causes eye strain which is unhealthy for our eyes in both the short-term, and especially, in the long-term for eye health. Yup according to research post-partum depression and seasonal affective disorder sufferers can all benefit from minimising their exposure to excessive blue light. The American Medical Association has admitted that humans could be at an increased risk of developing certain types of cancer from exposure to blue light at night. This is mainly seen in shift workers like nurses and factory workers. Who Should Wear a Pair? Everyone who wants to help protect their eyes. Really, I do believe that. All our eyes get affected negatively to artificial lightening. Some people are affected more than others as we are all at different levels of health and mitochondrial energy. This is why we biohack, to figure ourselves out and how to fix ourselves. Children who now grow up with their own personal electronic devices to keep entertained need a pair. Their developing eyes and brains need to be helped. We will only be able to tell the real impact once these children grow up and we have more stats. However, parents that are biohackers not only want the best for themselves, but also their families. When to Wear Your Glasses? If your main aim is to help set your body clock and improve your circadian rhythm them lots of people like to use them as sleep glasses. In this case put them on 1-2 hours before you know you want to go to sleep. This way you can wind down and get your brain to make the melatonin you need to feel sleepy. If you are looking at long-term eye health and general wellness then you’ll need two pairs. One for during the day. I mentioned the light yellow lens Duco option for this. 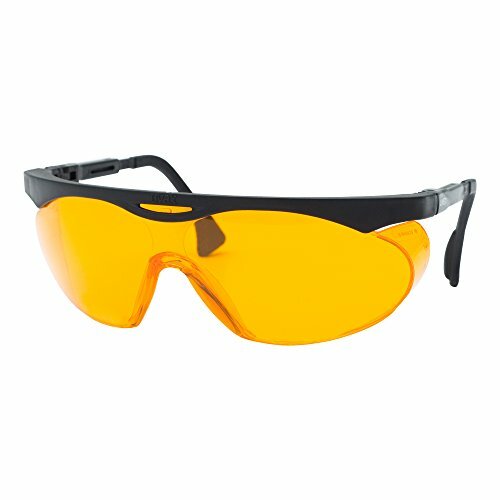 If you work indoors you can still benefit from wearing a pair to protect your retinas. Do take them off when you are outside to enjoy the natural sunlight. One for during the evenings. When the sun sets and darkness creeps in we turn our lights on. However, this is when you put on the amber glasses. This allows you to watch TV and do things around the house at night. You could go out to a bar or a club or perfect for when going to the cinema to watch a movie. 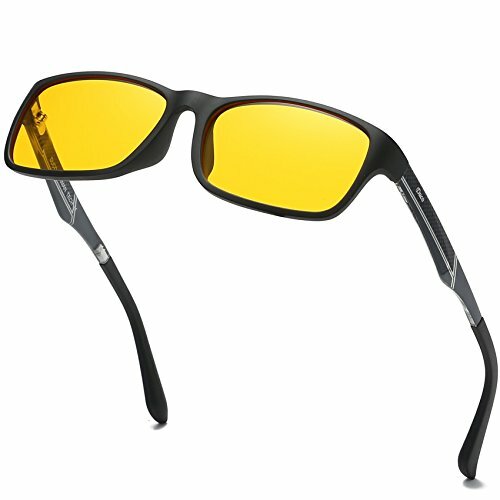 This will not only protect your eyes, but your natural sleep/wake cycle. If you are reading this post in bed, order a pair of glasses today and you’ll eyes and brain will thank you for it. It’s important to remember that we should get exposed to the full spectrum of light wavelengths from the sun each day, which includes natural blue light. However, living in the modern world and using tech gadgets means we will be exposing our eyes to the bad type of blue wavelengths which can affect our natural production of melatonin and circadian rhythms. 3.1 Do Blue Light Glasses Work? 3.2 What Are the Benefits of Wearing Blue Light Blocking Glasses? 3.3 Who Should Wear a Pair? 3.4 When to Wear Your Glasses?